A blogging friend was asking what is our usual Christmas dish. I honestly couldn't think of any because we were always on the look out for something different every year. Until I remembered as I was doing this dish that it was probably the fourth time I made it. So by the number of occurrence this could be our traditional family Christmas dish. Like some popular food, Beggar's Chicken has a romantic tale behind it. There are many versions but from what I have read it began when a starving, homeless beggar in rural China caught and stole a chicken from a yard he passed by. He killed it, built a fire and prepared for cooking. Suddenly, a posse of the emperor's guards came passing by. In his panic to hide the chicken he covered it with mud and threw it into the fire. The resulting baked chicken was said to be the most tender and flavourful he's ever eaten. Nowadays the dish is not exactly beggar friendly due to the high price it commands in Chinese restaurants. You have to order it way in advance before you dine since it involves very long cooking times. A special mallet is used to ceremoniously open it and the honor is normally reserved to an esteemed guest. I adapted the recipe I found in the Australian Women's Weekly's Chinese Cooking Class Cookbook which has a simple stuffing - actually not stuffing - just a sauce that you put inside the cavity. The dough is not meant to be eaten and becomes rock hard when baked which means it kept all the flavour and aroma in. Once you split open the dough after 4 hours of baking the scent escaping is simply marvellous. The meat is fall-off-the-bone tender, juicy, and very succulent. To make the dough, mix flour and salt in a bowl. Gradually stir in water. Mix into a firm dough ball with your hands, a little extra water may be needed. Do not have the dough too soft or it will be hard to handle. Preheat oven to 475°F/240°C/fan 220°C. Mix shallots, ginger, sugar, soy sauce, cooking wine, and water in a small bowl. 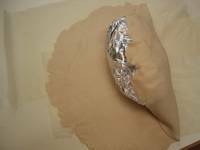 Place two very large sheets of aluminum foil (one on top of the other) on the table. Brush top sheet with oil. Put chicken in the middle of the top foil. Rub chicken with soy sauce all over. Repeat with the oil. Pull skin at neck end down under the chicken. Tuck wing tips under chicken and over the neck skin. Carefully pour the shallots-soy sauce mixture into chicken cavity through the posterior opening, holding chicken up slightly so that no sauce runs out. Secure end of chicken with a small skewer or needle and thread. 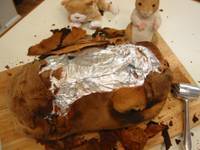 Wrap aluminum foil around the chicken one at a time and secure like a parcel. It is important that the foil does not have any tear or hole in it (especially at the bottom) so that the salt in the dough will not penetrate the chicken itself. 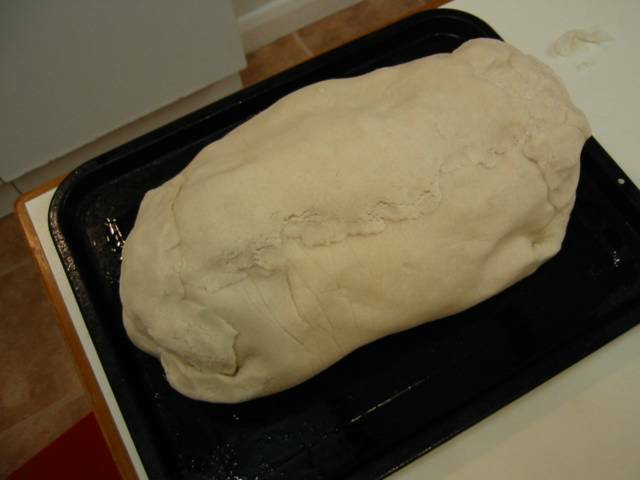 Roll dough out to approximately 1 cm (1/2 inch) thickness so that it will completely encase the chicken. Fold dough over the chicken. Press edges and ends together. Make sure that there are no holes in the dough. Place chicken into lightly oiled baking pan. With wet fingers, smooth out all joins making sure there are no holes in the pastry for the steam to escape. 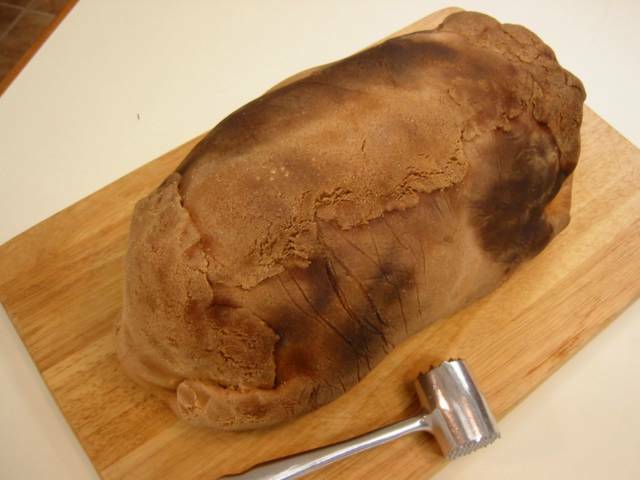 Bake in 475°F/240°C/fan 220°C oven for 1 hour. Reduce heat to 325°F/160°C/fan 140°C and bake for a further 3 hours. Remove chicken from the oven. Break open pastry clay with mallet or hammer. 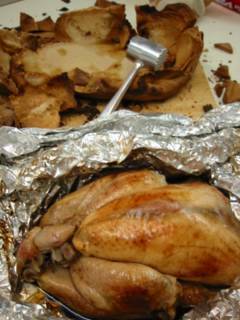 Lift foil-wrapped chicken onto serving plate and carefully remove foil. *Note: The 1 kg cooking salt in the dough recipe does not influence the taste of the chicken - just ensures that the dough bakes rock-hard as protection for the chicken during the long cooking time.